I started this quilt for my great-nephew weeks and weeks ago. But, of course, life gets in the way. Thankfully, he won’t arrive until sometime early November. But this week, I got it pin-basted and quilted. 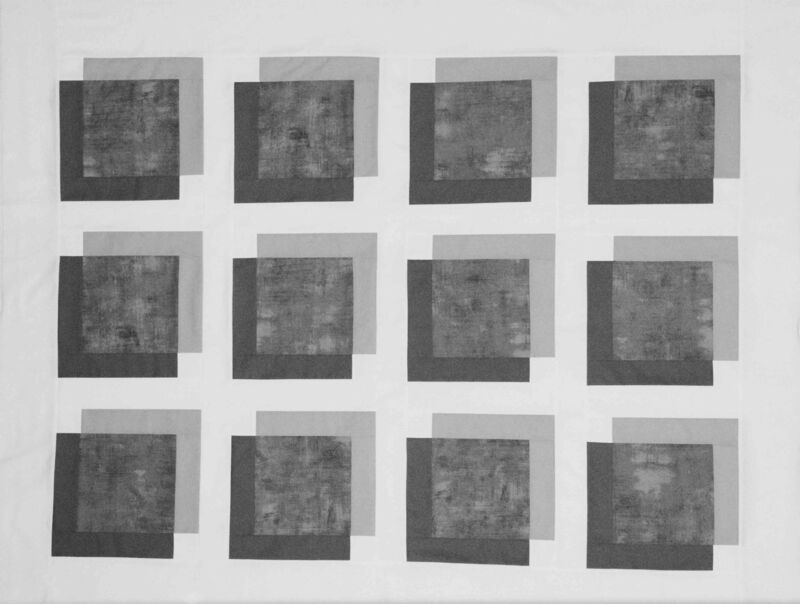 I am really liking the look of this quilt as it is very simple, yet sophisticated. The baby’s room is grey, and the parents are not really into “baby-cutesy”, so I think this will work. 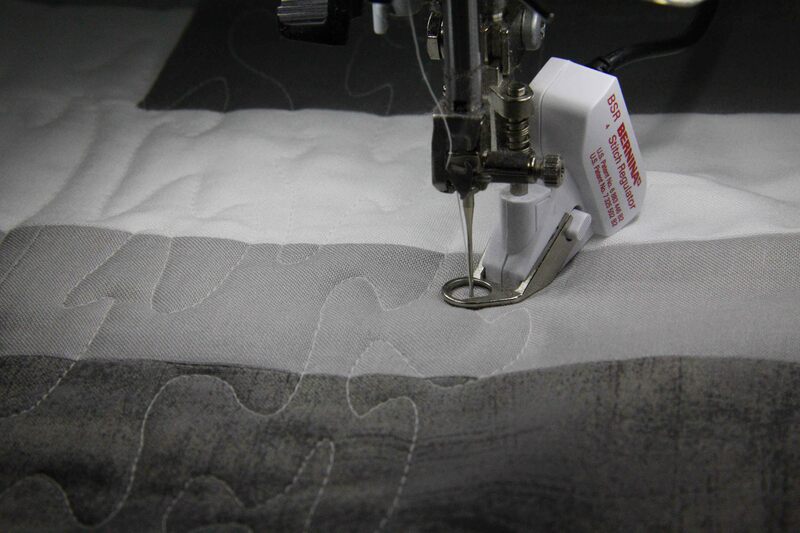 The quilting is very simple , with an overall pattern of horizontal stippling. While I really love some of the very intensive, complicated quilting that is really popular these days, I also think there’s a time and a place for simplicity….and this quilt needed simplicity. 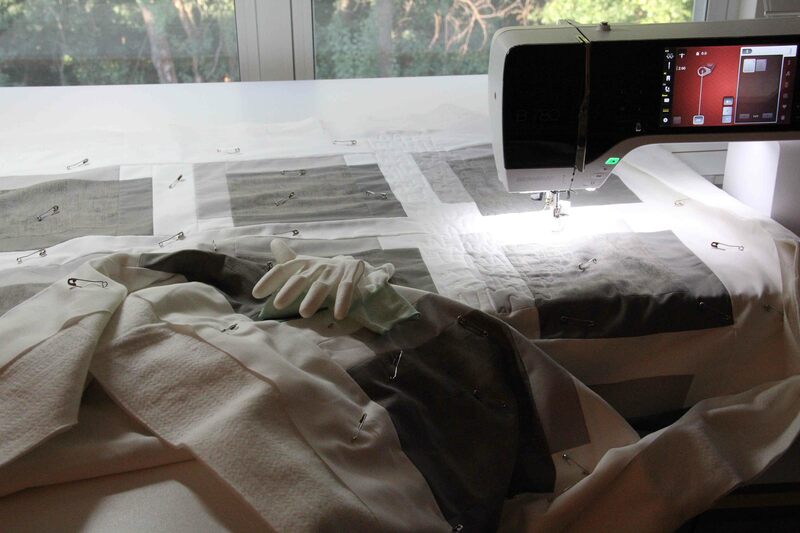 Getting started with machine quilting. Have to say, I love Machingers for machine quilting. I’ll never go back to any other type of gloves for control and gripping. They also keep my hands very cool, which can be a big deal. No one wants to work up a sweat while machine quilting. Also big on my list is the Bernina Stitch Regulator. Whatever your quilting skill level, this adds an ease that I have just come to appreciate. I can go at any speed and have the stitches be consistent every time. Now, I have done enough machine quilting that I don’t necessarily need the stitch regulator, but I have found that it makes the job so much easier on me. My shoulders don’t hunch quite as much. And I go way faster because the size of the stitch is not a struggle. Quilting is finished. Pattern by Weeks Ringle and Bill Kerr from their new book, “Transparency Quilts”. Finally, I used a bias binding, as I want this quilt for my great-nephew to last a long time. Bias binding has more fibers running along the edge of the quilt, so it will handle more washings, more rubbing, more overall use. 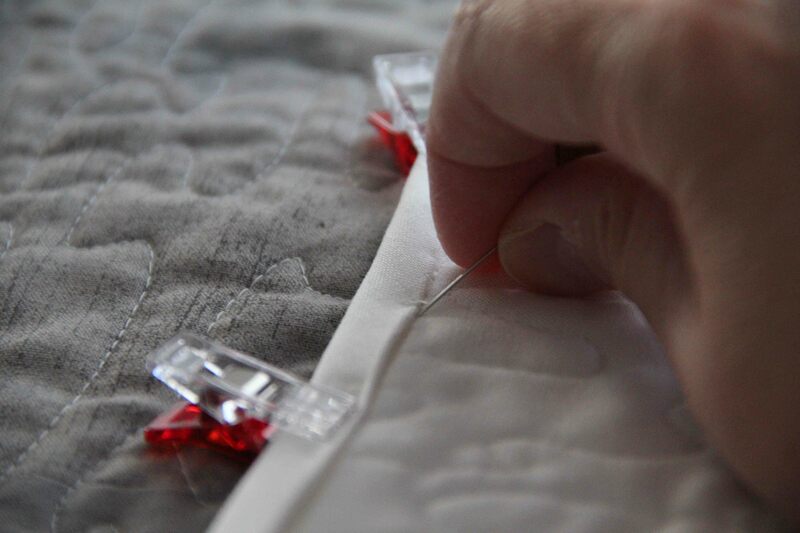 I always stitch the back of the binding by hand. I’m not one to use the machine for this final touch. I’m not even sure why, except that I love the feel of hand-binding, I love the look, and I think it adds a touch of hand-sewn love to every quilt. All that’s left at this point is a quilt label for my great-nephew. Well that’s a lot of black and white for one blog post, even though I am a big fan of black and white. 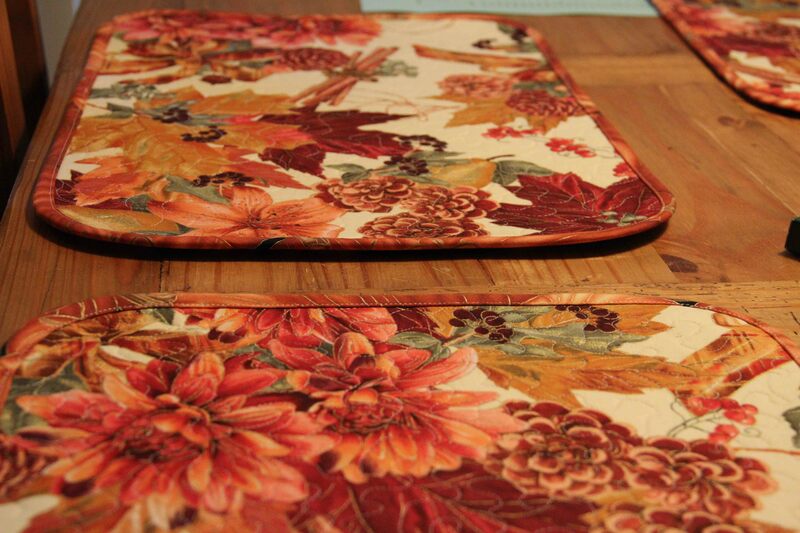 So here’s a finished pic of the fall placemats. They are colorful, completed and set up on the table. 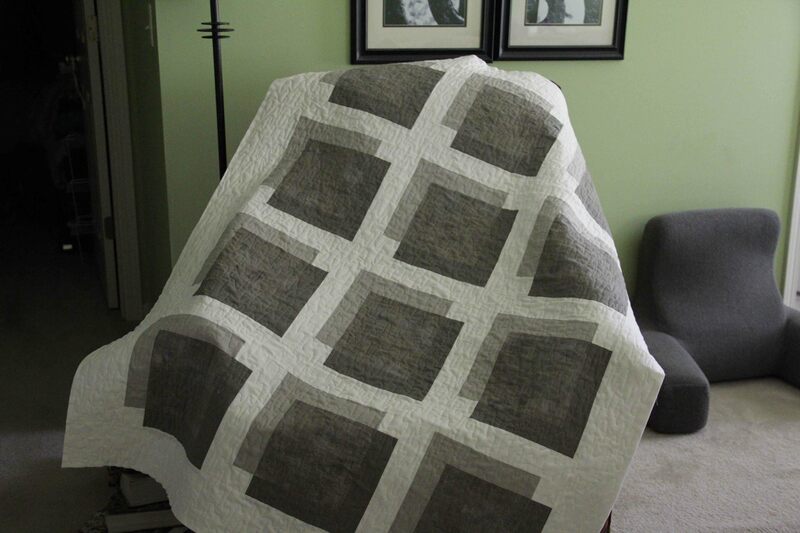 I love the way this turned out, it is very calming and your quilting is beautiful on it. I’m suddenly interested in transparencies, thinking of a king size one, and have enjoyed following your posts. thank you so much! Transparency quilts are very rewarding..it’s as though they have a surprise for you when they’re done, and you’re able to stand back and look at them.